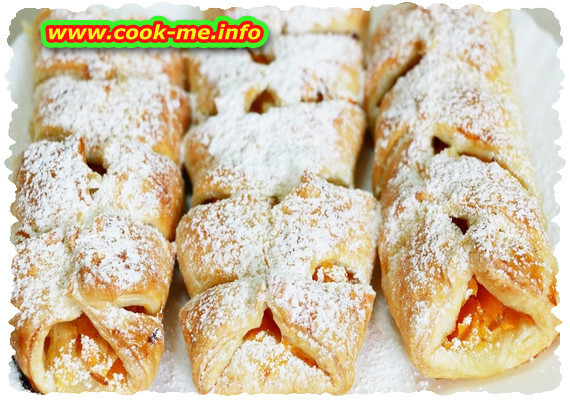 The strudel is an alternative to pumpkin pie, perfect as a dessert or a snack. Fry the grated pumpkin for a few minutes to soften with a little butter and sugar, turn the heat off, add the semolina and cinnamon to taste and let it cool off. Mix the yeast with warm water, 1 tsp of sugar and some salt. Mix the flours, make a hole in the middle and, in it, pour the rest of the ingredients (including the yeast). Knead the dough until it becomes elastic and non-sticky (if necessary, add warm water).Cover the dough and leave it in a warm place to double its size. Roll the dough, cut it in squares and add stuffing in the middle, roll the strudel and press the edges a little to make them stick. Decorate with powder sugar and serve warm or cold.